Hail Mary the Queen Children’s Choir will hold the fifth edition of its annual choral festival billed as Halina’t Umawit – A Philippine Children’s Choir Festival on October 26, 2013, 7pm at the Tanghalang Nicanor Abelardo (Main Theater) of the Cultural Center of the Philippines. The festival gives the country’s outstanding children’s choirs a venue to showcase their talents in their own forte. This year, the Halina’t Umawit Festival coincides with the recent victory of the Hail Mary the Queen Children’s Choir as they were declared the First Children’s Choir of the World in the 67th Llangollen Musical International Eisteddfodd held in North Wales, United Kingdom last July 2013. Five choirs will be participating in the Halina't Umawit Festival at the CCP: Ateneo Boys Choir under Daisy N. Marasigan, conductor, Colegio de Sta Rosa – Makati Himig Roseña under Nelson V. dela Cruz, conductor, Immaculate Conception Academy High School Glee Club under Veralyn D. Monte, conductor, St. Scholastica’s Academy Marikina High School Glee Club under Danilo N. Monte, Jr., conductor and the Hail Mary the Queen Children’s Choir under Ma. Theresa Vizconde-Roldan, conductor and Jude B. Roldan, music director. The Festival derives its name Halina’t Umawit from Psalm 95 and Psalm 98 of the Bible. It is an invitation to come and sing praises to the Lord for His wondrous deeds. The festival song with the same title composed by Jude Roldan completes the event with all choirs singing on stage interspersed with hand clapping and feet thumping. 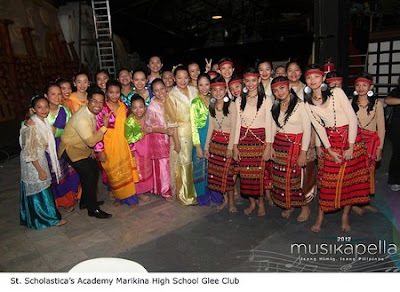 Some of the choirs who have participated in the festival through the years include Kilyawan Boys Choir and the Voces Aurora, Mandaluyong Children’s Choir, Las Piñas Boys Choir, Calasiao Children’s Choir, Hiyas ng Pilipinas, Baao Children’s Choir, St. Paul College Pasig High School Chorale, Samiweng Singers and Vox Angeli Children’s Choir. For more details, please call CCP Box Office at (63 2) 832-3704 and Ticketworld at (63 2) 891-9999.